We use high-quality proteins from Salmon and Chicken Meal from the USA, and no artificial flavors, Pumpkin and added chicken fat adds to a delicious taste. Calorie Content (Calculated): This food contains 3,575 kcal/kg or 380 kcal/cup ME (metabolizable energy) on an as-fed basis (calculated). 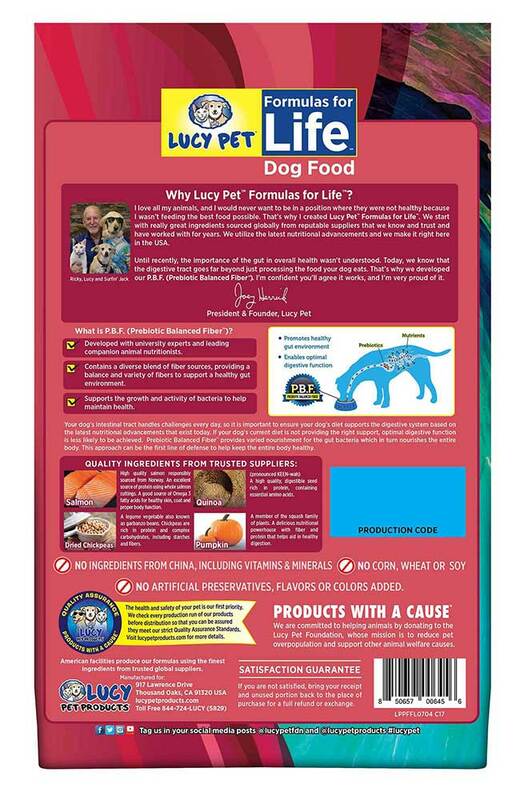 Lucy Pet Formulas for Life ™ Salmon, Pumpkin and Quinoa Formula Dog Food is formulated to meet the nutritional levels established by the AAFCO Dog Food Nutrient Profiles for maintenance, including the growth of large size dogs (70lbs or more as an adult). 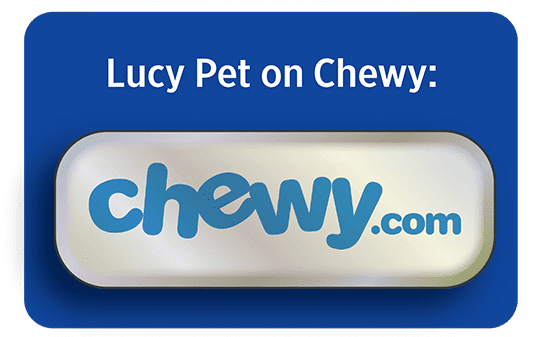 Since our formula is complete and balanced, Lucy Pet recommends that you do not add vitamins, minerals, or any other supplements, except upon the advice of a veterinarian. 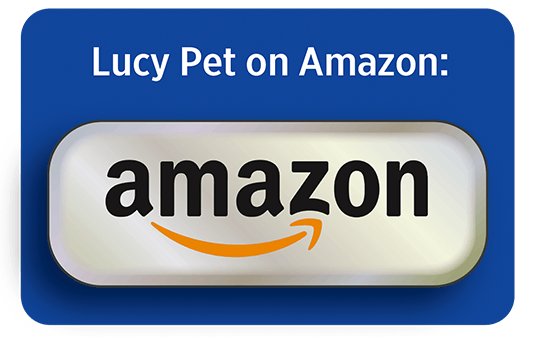 Lucy Pet’s Salmon, Pumpkin, and Quinoa Grain Free Formula features our advanced P.B.F. 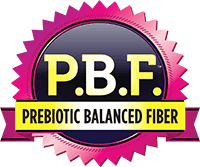 Prebiotic Balanced Fiber (TM) to produce an optimal environment in the digestive tract to lead to an optimal balance in the gut. The number one ingredient is Wild Alaskan Salmon. Includes chicken meal from the USA, chickpeas (rich in protein and complex carbohydrates, including starches and fibers), delicious pumpkin (a nutritional powerhouse with fiber and protein that helps aid in healthy digestion), and quinoa, (a high quality, digestible seed rich in protein, containing essential amino acids). This formula includes a superfood blend of ingredients naturally preserved. No ingredients from China, including vitamins and minerals. Salmon, chicken meal, dried chickpeas, dried peas, pea starch, chicken fat (preserved with mixed tocopherols), dried pumpkin, quinoa, dried carrots, ground miscanthus grass, natural flavor, flaxseeds, dried chicory root, DL-methionine, salt, potassium chloride, dried kelp, choline chloride, vitamins (vitamin E supplement, niacin, D-calcium pantothenate, vitamin A supplement, riboflavin supplement, thiamine mononitrate, pyridoxine hydrochloride, vitamin B12 supplement, vitamin D3 supplement, folic acid), L-ascorbyl-2-polyphosphate, taurine, minerals (ferrous sulfate, zinc proteinate, zinc sulfate, iron proteinate, copper sulfate, sodium selenite, copper proteinate, manganese sulfate, manganese proteinate, calcium iodate), mixed tocopherols (preservative), citric acid (preservative), L-carnitine, turmeric, yucca schidigera extract, rosemary extract.